Mary Dixon Kies was an American inventor. On May 5, 1809, her patent for a new technique of weaving straw with silk and thread to make hats was signed by President James Madison. Some sources state that she was the first American woman to receive a patent. Because of the Napoleonic Wars, the United States embargoed all trade with France and Great Britain, creating a need for American-made hats to replace European millinery. The straw-weaving industry filled the gap, with over $500,000 ($9 million in today's money) worth of straw bonnets produced in Massachusetts alone in 1810. 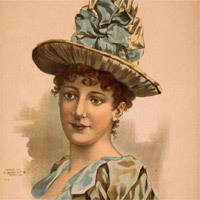 Mary Kies was not the first American woman to innovate in hat-making. In 1798, New Englander Betsy Metcalf invented a method of braiding straw. Her method became very popular, and she employed many women and girls to make her hats. The method created a new industry for girls and women because the straw bonnets could be made at home from local resources, so the women and girls could do work for themselves. Thus, Betsy Metcalf started the American straw-hat industry. Under the Patent Act of 1790 she could have sought a patent, but like most women at the time, who could not legally hold property, she chose not to. Mary Kies, however, broke that pattern on May 5, 1809. Dolley Madison was so pleased by Kies' innovation that she sent a personal letter applauding her. Kies' technique proved valuable in making cost-effective work bonnets. In so doing, she bolstered New England's hat economy, which had been faltering due to the Embargo Act of 1807. However, a change in the fashion of the day made her unable to profit from her invention and she died penniless in 1837. Her original patent file was destroyed in an 1836 fire at the United States Patent Office.